LOCATION: Partial shade is best. PLANTING: Fall from transplants or seed. BLOOM/FRUIT: Umbels of tiny white flowers in early summer. GROWTH HABITS/CULTURE: Leafy annual herb with branched hollow stems and bright green finely textured leaves that readily self seeds. Looks like Italian parsley, likes cool weather, can take some frost. Will bolt during the first warm days of spring. Will self sow. Keep well watered to prevent premature seeding. Likes partial shade. HARVEST/STORAGE: Harvest anytime. Best to use fresh from the garden. CULINARY USES: Use the same as parsley in salads, soups, sauces and garnish. Flavor has a hint of licorice. MEDICINAL USES: Eat or use as a tea to help purify the body. It is a mild digestive, helps circulation, and soothes painful joints. Leaves contain Vitamin C, carotene, iron and magnesium. Chervil also reduces phlegm and liver problems and is good for the skin. LANDSCAPE USES: Too short lived to use in large areas. INSIGHT: Blends well with other herbs. Description. 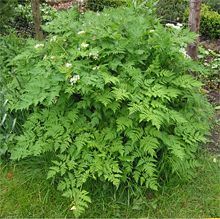 Chervil grows to a height of 12 to 26 inches (30 to 66 cm). Its small white flowers bloom from May through July. Chervil prefers light shade. It is best to serial plant in order to maintain a ready supply. Chervil can be grown in a window box, and it will over-winter if the temperature stays at 45°F (7°C) or higher. Chervil is best used fresh. To store fresh chervil, wrap it in damp paper towels and plastic and keep it in the crisper or hydrator in the refrigerator. It can only be used for two to three days. Its short life span means that it is difficult to find for sale, and this is one reason that it is not well known. Food and Other Uses. Chervil has a lemon-anise flavor that is lost with long cooking. Because of this fragility, it should be added at the very end of preparation of cooked foods or used as a garnish. There is not much use for dried chervil.